I turned to MDS -- once again -- to make this sophisticated hybrid card. Only the main focal image was generated through MDS. The old bike image from the recent Sale-A-Bration stamp set Feeling Sentimental was perfect for what I had intended. Not possessing the actual stamp set, I turned to the set I had in my MDS arsenal of wonders. 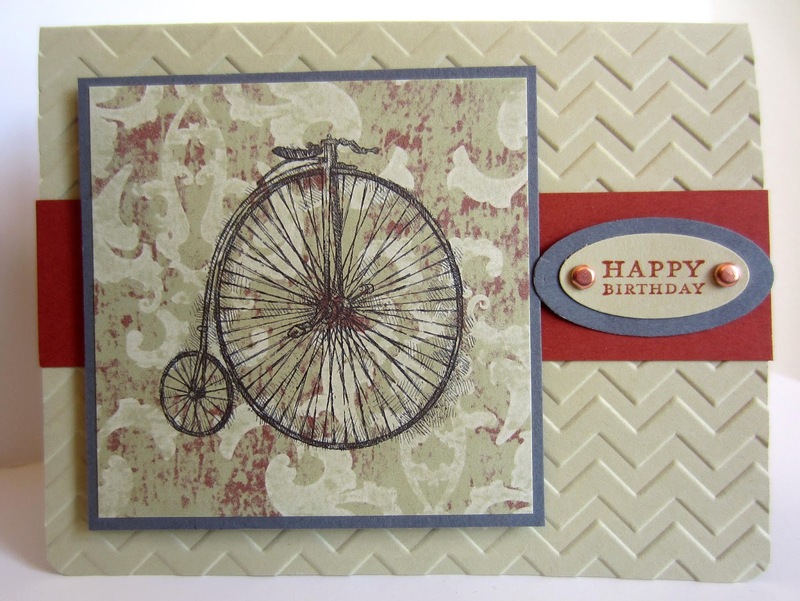 I chose a Designer Series Paper that fit with the antique feel of the image, decreasing the opacity of the DSP so the sketchy bike showed up better. After printing out the image, I headed down to my creation station to finish the card. The Chevron Embossing Folder added more dimension and a masculine touch, as did the color scheme of (retired) River Rock, Cajun Craze and Basic Gray, with a spark of copper in the brads. Happy Birthday to my son-in-law, Stephen! That came out cute. You have got me hooked once I get a new computer. And a Happy Birthday to Stephen. It was great seeing you too! Cute card! My husband loves those old bicycles. Love the chevron embossing folder. I will have to get one. Thanks for sharing! So pretty!! Thanks for linking up at Romance on a dime!